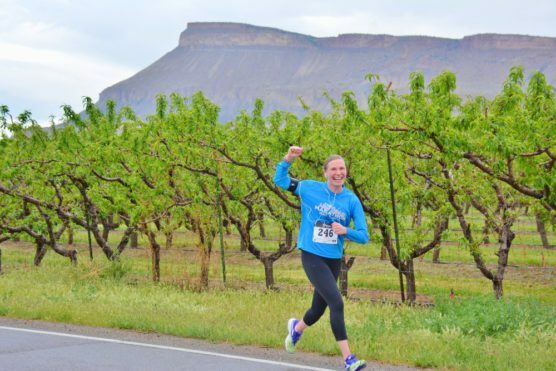 One of the nation’s most scenic geographic treasures will be every runner’s companion — from a distance, that is — at the annual springtime running of Palisade’s Grand Valley Marathon, Half Marathon, 10K & 5K, which take runners on an out-and-back tour of this area’s peach orchards and wine vineyards. From the starting line in downtown Palisade, a small western Colorado town that stands at the entrance to the Grand Mesa and Arapahoe National Forests as well as the many ski resorts and mountain towns that populate the Rocky Mountains here in western Colorado. Known for its wineries as well as its easy access to the Powderhorn Ski Resort, Palisade also is considered the “peach capital” of Colorado thanks to the plentiful orchards that lie near the river just south of town. Photo courtesy of the Grand Valley Marathon & Half Marathon. Start and finish in Palisade. 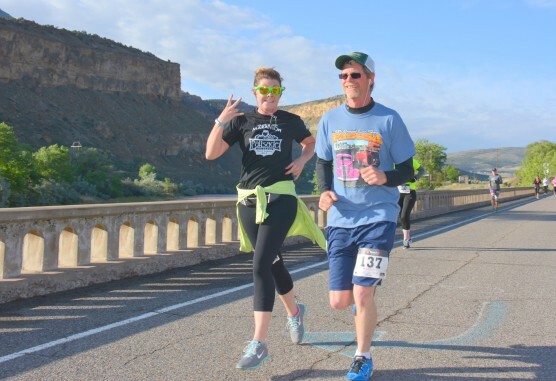 Runners start the out-and-back course for the race in downtown Palisade near the intersection of Main Street and West 3rd Street, and from there head east on a route that takes them along the Colorado River, which flows through the city from nearby DeBeque Canyon. The course takes runners over the bridge across the river just as they’re passing the mile 2 marker, where they meet up with G Road and then follow it southward and westward as it takes them in front of the base of the Grand Mesa, the dramatic rock formation that rises about 5,000 feet above the surrounding valley. Stunning views of the largest mesa in the world. Stretched across roughly 500 square miles of western Colorado, the Grand Mesa is mostly contained within the national forest area that takes its name, and is mostly flat — in fact, some 300 lakes and ponds are scattered far and wide across the top of the mesa. 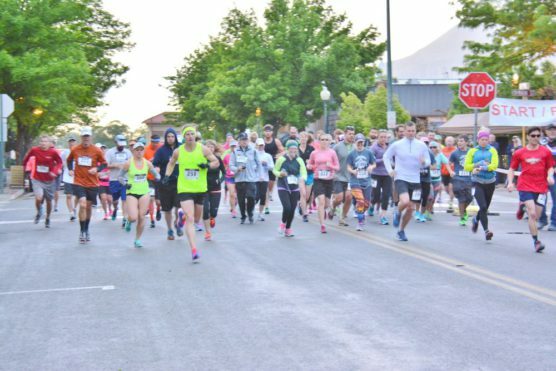 As runners turn from G onto 38 Road and pass between mile markers 4 and 5, they encounter the steepest hill of the race, a hill that climbs about 195 feet as it brings runners to one of the Grand Valley’s scenic overlook areas. The race route flattens out for a bit as it brings runners south and west along F 1/4 Road and F Road to the half-way turnaround point. 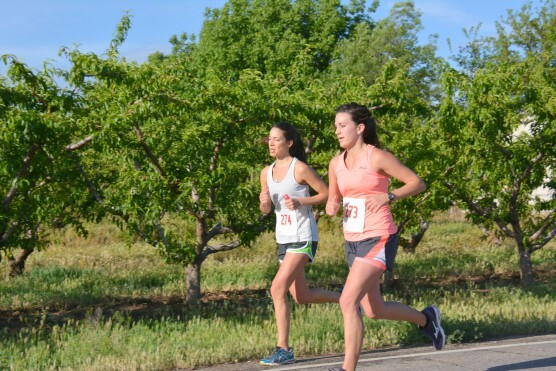 Then, runners head back along the route in the opposite direction, heading a second time past the orchards and wineries near the mesa on their way back into Palisade for the race finish. Located less than an hour’s drive from Colorado’s western border with Utah, just over 12 miles northeast of Grand Junction, Palisade typically sees mild to moderately warm and usually dry weather in May, which has brought record temperatures here as low as 29ºF (in 1997) and as high as 98ºF (in 2000). See the race route map for the Grand Valley Half Marathon here. 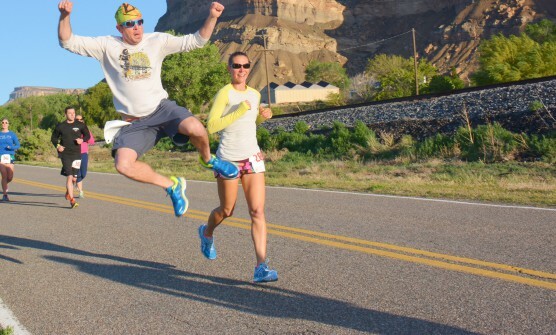 To reserve your spot in the 2019 running of Palisade’s Grand Valley Marathon, Half Marathon, 10K or 5K race, register online at RaceEntry.com here. 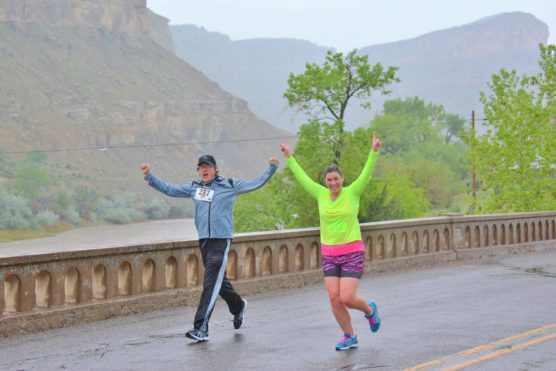 Ever run in the Grand Valley Half Marathon? Share your impressions here, or post your review in the Comments below.